Marian Wright Edelman, founder of the Children’s Defense Fund, was born June 6, 1939 in Bennetsville, South Carolina. She was the youngest of five children born to Rev. Arthur Jerome Wright and Maggie Leola Wright. Rev. Wright, a Baptist minister, died when she was fourteen. He proved, however, an important influence on her life by teaching that Christianity required public service. Marian Wright attended racially segregated public schools, but excelled academically despite the inadequate opportunities offered to her in those institutions. After graduation Wright attended Spelman College, a prominent institution for black women in Atlanta, Georgia. While at Spelman Wright received scholarships to study abroad that took her to Paris, Switzerland, and the Soviet Union. With that experience she planned to pursue a career in Foreign Service, but as the 1960s civil rights movement unfolded, she found herself involved in its activities. Wright participated in and was arrested in Atlanta, Georgia sit-ins in 1960. These experiences made her realize that she could contribute to social progress through the study of law. She entered Yale Law School in 1960 on a scholarship and received her law degree in 1963. Shortly after graduation, Wright was hired by the National Association for the Advancement of Colored People (NAACP) Legal Defense Fund. After one year, she moved to Jackson, Mississippi to work on voter registration drives for the NAACP. There she became the first African American woman admitted to the Mississippi State Bar. In 1964 Wright represented civil rights activists during the Freedom Summer voting campaign. In the same year she was hired as a lawyer for the Child Development Group in Mississippi. After successfully lobbying for the restoration of Federal funds for the Mississippi Head Start programs, she realized she truly enjoyed fighting for children’s interests. In 1967 Marian Wright met Peter Benjamin Edelman, an assistant to New York Senator Robert Kennedy who was touring the Mississippi Delta. She moved to Washington, D.C. where she and Edelman were married on July 14, 1968. They then had three sons: Joshua Robert, Jonah Martin, Ezra Benjamin. Edelman’s relocation to Washington and her marriage to a prominent Washington policymaker afforded her the opportunity to introduce her work with Mississippi’s poor to the national political arena. In 1968 Edelman created the Washington Research Project for the Southern Center for Policy Research to lobby for, and assist, children in poverty. In 1971, Time magazine named her one of the top 200 young leaders of America. 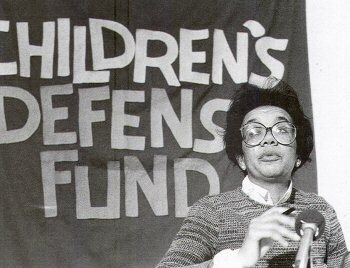 In 1973, under Edelman’s guidance, the Children’s Defense Fund (CDF) was founded. It aimed to help children be healthy, stay in school, and avoid teenage pregnancy. The CDF also worked to prevent childhood abuse and drug abuse. The organization became one of the leading national advocates for children. Edelman has been recognized around the world for her causes. She lectures and has written many books including: Families in Peril: An Agenda for Social Change (1987) and The Measure of Success: A Letter to My Children and Yours (1992). On August 9, 2000, President Bill Clinton awarded the Medal of Freedom to Marian Wright Edelman, the highest civilian honor available. She has also received the Albert Schweitzer Prize for Humanitarianism and a MacArthur “Genius” Award.